College Hill has far more residents than were ever imagined when the neighborhood was laid out in the late 1800s. As a result, our pedestrian-centric neighborhood has too many cars running through overcrowded streets and off-kilter intersections, often recklessly and too fast. 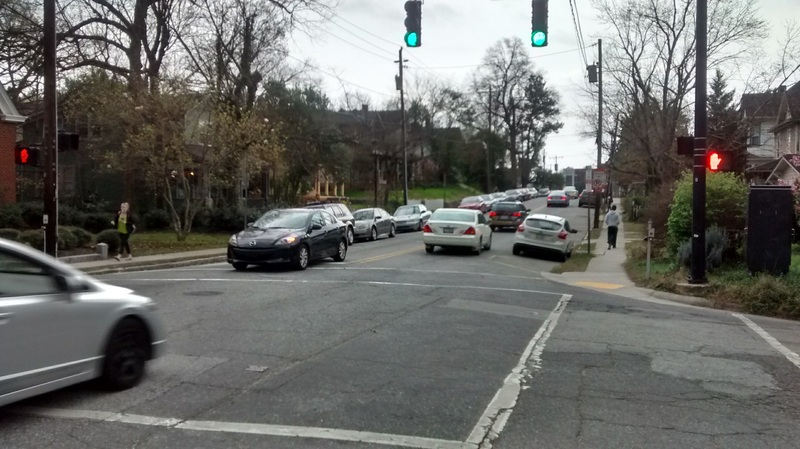 A major neighborhood initiative to slow traffic and make our streets safer and more attractive took its first step Tuesday when the city issued an RFP to develop permanent improvements to streets, sidewalks, crosswalks, bicycle lanes, etc. After this planning/design phase, improvements will be selected jointly by the neighborhood association and city. Then they’ll be engineered and implemented. The cost of planning, design and implementation will be covered by money from the College Hill Municipal Service Fund. The project has been initiated by the neighborhood as the result of needs identified by residents in the 2015 neighborhood plan. That plan was developed by the neighborhood and city Planning Department. The timeline calls for a firm to be selected by May 31 and for planning and design work to be complete by the end of November. Anyone interested in the entire 13 pages of dense and largely boilerplate city government prose should click here. a. Review current studies and reports and visit the neighborhood at various times of the day and week to observe pedestrian and traffic conditions and overall visual impacts of current neighborhood signage and gateway treatments. Review current traffic count and accident information and GIS base mapping provided by City staff, in order to gain an understanding of existing conditions in the neighborhood. A walking tour of the neighborhood with City staff and CHNA Board members may be conducted during this Task. The result of this analysis will be an understanding of the neighborhood opportunities and constraints and development of an initial list of priority street segments, intersections, and branding options for further study. b. Prepare conceptual drawings to illustrate possible design solutions for the priority intersections and street segments along with recommendations for neighborhood signage and branding upgrades to create a cohesive neighborhood street upgrade program. An on-site public workshop in which residents and City staff can vet multiple possible design solutions quickly may be considered. Said concepts shall be developed in close coordination with City staff, to ensure general acceptability to all relevant departments. c. Where appropriate and feasible, recommend and carry out temporary tactical treatments to alter street, intersection, and/or sidewalk configurations, for the purpose of slowing traffic, improving safety, and/or enhancing the experience of pedestrians, bicyclists, and other road users. These temporary treatments may include but are not limited to new paint striping, artistic installations, bollards and landscaping features, street furniture, and signage. Said treatments shall be developed and carried out in close coordination with City staff, to ensure general acceptability to all relevant departments. d. Identify metrics and conduct evaluation activities before, during, and after implementation of temporary tactical treatments. Metrics and evaluation techniques will be selected based on suitability for understanding which aspects of the temporary treatments worked well and which ones could be improved upon. Metrics and evaluation techniques may include but are not limited to collection, analysis, and/or interpretation of: motor vehicle speed and traffic volume data, on-street parking usage data, bicycle and pedestrian traffic data, traffic law compliance rate data, comparison of posted speed limits to street design speeds, suitability of street geometry, traffic conflict points, resident feedback, etc. e. Based on the results of Tasks c) and d), develop a package of recommended permanent improvements to the neighborhood’s streets, sidewalks, crosswalks, bicycle lanes, etc. These recommendations will form the basis of a scope of work for future engineering and implementation project contract(s), and shall be developed in close coordination with City staff, to ensure that the resulting conceptual designs are generally acceptable to all relevant departments. f. Develop a coherent branding and signage scheme that integrates proposed supplementary signage and fixtures, with those already in the neighborhood, in order to raise awareness of and enhance the neighborhood’s historic character. The branding and signage scheme shall be developed in close RFP Page 8 of 13 coordination with City staff, to ensure generally acceptability to all relevant departments. g. Conduct a final community meeting, during which the results of Tasks e) and f) above will be presented to property owners, residents, businesses, and other interested parties, for review and feedback. h. Maintain regular communication with College Hill Neighborhood Association and City staff contacts by providing bi-weekly (at a minimum) progress reports via telephone or email. Prepare a summary report documenting the findings and results of tasks a) through g). This entry was posted in City Government, College Hill Neighborhood Association, Municipal Service District, Parking, Public Safety, Traffic and tagged Traffic. Bookmark the permalink.